Back in 2013, Brian Kenny of the MLB Network began a campaign called “Kill the Win.”Ã‚Â The point of Kenny’s campaign was to help baseball fans, broadcasters, and writers understand that wins and losses are a bad way of evaluating the success or failure of a pitcher. The campaign was overall successful. Sure, there was much resistance from old school baseball folks to begin with, but it seems like wins and losses are beginning to be devalued by baseball people on an overall scale. Now we need to move on to another statistic that is outdated, and extremely overvalued: Batting Average. Batting average doesn’t include walks.Ã‚Â A player drawing a walk is a good thing, and it should be included when evaluating a player’s success. If you don’t believe that walks are important, watch the 2016 Chicago Cubs. Batting average weighs a single the same way it does a home run. Clearly hitting a home run is much better than hitting a single. Why should the two outcomes be equal? These two concepts seem pretty easy to understand. So why do most MLB radio broadcasters say “here comes Bryce Harper to the plate…..he comes into tonight’s game hitting .260”? Or, if you are watching on TV, a network like FOX Sports Ohio usually only shows a players AVG, HR, and RBI totals when he comes up to the plate. The knowledge that Bryce Harper is hitting .260 literally tells me nothing about how good he is. Note: Great American Ballpark has done a great job recently by making a players OBP and OPS easily seen on the scoreboard. That is a huge step towards smarter baseball thinking. We also love FOX Sports Ohio’s Chris Welsh. He always tries toÃ‚Â incorporateÃ‚Â advancedÃ‚Â statisticsÃ‚Â as much as possible. I understand that I’m not going to convince an old school baseball fan or broadcaster to start using great statistics like weighted runs created plus (wRC+), weight on-base average (wOBA), or wins above replacement (WAR). The formulas for those statistics are complex and difficult to understand, and because of that some question their validity. For the most part, that is alright. However, I have a compromise that I think if people would just give it a chance, it could work. OPSÃ‚Â is not a new stat. Most casual baseball fans have at least heard of it. If you haven’t heard of it, OPS stands for On-Base plus Slugging. OPS literally just adds a players On-base percentage (OBP) and Slugging percentage (SLG) together. In case you don’t know what OBP and SLG are, in simple terms, OBP is just batting average with walks included, and SLG determines a players power by calculating total bases divided by at-bats. So if a player has a .400 OBP and a .500 SLG, their OPS is .900. Note: in 2015 there were 11 players with an OPS above .900. 10 of those 11 players were also in the top 10 in wRC+, and the only one who wasn’t was David Ortiz who came in at 16th. So OPS and wRC+ many times are very similar in seeing a players batting value. One thing that hurts a stat like OPS from taking off is simply baseball fans not understanding what is great, good, average, below average, and bad. What is the equivalent with OPS to hitting .300? What is an elite OPS number? What is average? I understand that batting average is embedded into baseball. Everyone knows and understand when a broadcaster says “Bryce Harper comes in as a .260 hitter.” Old habits are difficult to break. It will take time for change, but just like with win and losses for a starting pitcher, I believe we can overcome. One of my favorite lists of all-time is the list of players with a .300 or better AVG who had a .700 or lower OPS in the same season. So these players were likely drastically overvalued for their seasons. The only player to accomplish this feat since 1981 was Ben Revere in 2014 (that is why he earned the featured image for this post). Revere hit .306 in 2014, but the reason he was actually a below average hitter that season was that only 20 of his 184 hits were extra-base hits, and he only walked 13 times in 626 plate appearances. Statistics Glossary for Reds Fans! The four time World Series Champion Stuffy McInnis! I also think Candy LaChance is an underrated name too. He earned the nickname “Candy” because he preferred to chew on peppermints rather than chewing tobacco (wiki). He spent 6 years playing for the Brooklyn Grooms & Bridegrooms (Dodgers). What about the opposite, a list of 900 OPS with an average say .250 or lower. Remember Votto has a career OPS about .950!!!!!! Great idea! There were only 6 occurrences of that. No surprise, our own ADAM DUNN makes the list. But, but… nah, no rebuttals here. Nicely written and articulated. What’s wrong with using both? Sure, batting average alone shouldn’t be used to measure a player’s success, but I don’t think it should just be thrown out completely. wRC+, OPS, WAR and wOBA are obviously better measures of a player’s overall success, but batting average definitely still tells us something about a hitter. Uh, not really. It’s also highly variable from season to season, where OPS is much less so. If the goal of stats is to convey useful information, less variability is ideal. It’s like if you went to buy something and the price changed everyday of the week. On any given day it would be a random price. How would you decide when to buy. A smart buyer would see what the range of prices for a few weeks, and buy near the lower end of the range. I’ve been convinced, while still not conversant with them, that the newer stats are more useful than the old ones in evaluating a player. However, it seems mostly true that players with high batting averages have historically been good hitters by any measure. Not all of them (somebody, I know, will name exceptions), certainly, but many of them. Batting average is not as useful as once thought, but it may not be totally useless for casual reference, either. Any time you can be on a list with Stuffy McInnis and Wee Willie Keeler, you know you’ve made it. Great write-up, Nick! As I’m sure you can surmise, I also support not using AVG as a way to evaluate…well, anything. If you can assume your audience can do some basic addition, I really prefer the ‘ol triple-slash line (if wOBA and wRC+ are off-limits). Gives you AVG, OBP, SLG, OPS, ISO, and you can also infer a lot about a player’s plate discipline and approach. So much useful info can be gleaned from a line like .360/.350/.550 (which is something similar to what we saw Cozart with around the end of April). In this weird case, we can understand that Cozart actually had more sacrifices (count against OBP, but not AVG) than walks. I certainly prefer wRC+ to OPS, but for the most part the numbers are so close that it doesn’t really matter all that much. It seems like fans who are opposed to sabermetrics are more open to OPS (a calculation that is pretty easy to understand) more so than more complicated calculations. You are certainly correct. OPS is the key that opens the door to a bigger world, perhaps! Agree completely with the triple slash. Folks won’t be convinced to switch their analysis or way of thinking by saying you’re dumb if you evaluate players using BA. 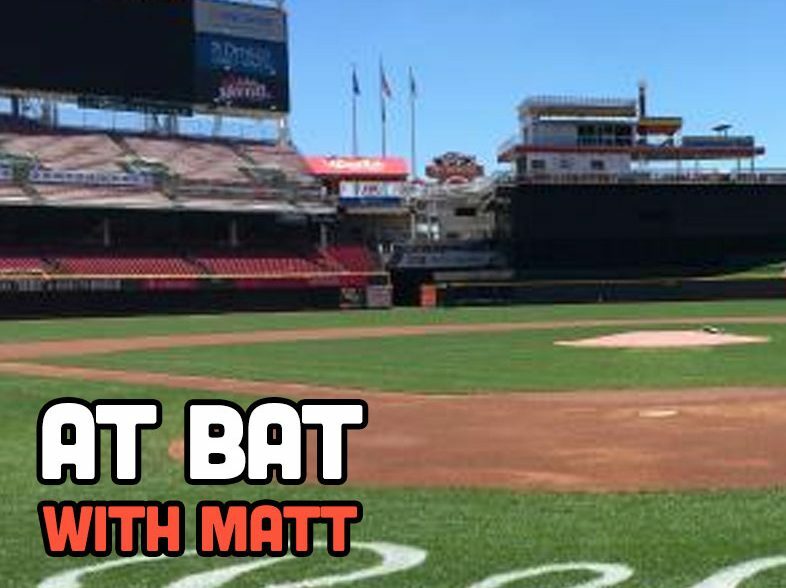 Incorporating OBP, SLG, OPS into broadcasts, radio, write-ups, etc. is the first step to get the masses comfortable with add’l/better ways to evaluate a player, and it finally seems to be happening. Hits are important! Therefore Batting Average is important. A hit is a hit. If a team were to put together a lineup that’s good or great in those other so-called more accurate statistics but who has relatively low BA’s, how’s that team gonna have a successful offense? Fans don’t like complicated formulas. The simpler the better. Thanks for reading. I understand what you are saying, but do you think a HR is just as good as a Single? I’m probably not going to convince you that walks are a good thing, and that is fine. But I’m sure you don’t believe a single is as good as a home run. Are you saying a walk is as good as a hit?????? Sometimes a walk is as good as a hit. A leadoff walk is just as good as a leadoff single. With a runner on first, a walk is as good as a single almost all the time, unless you have a fast runner on base and the ball is hit to right field, allowing the runner to go to third (although sometimes that runner gets thrown out trying to take third, so even that’s not always better). In other situations, usually with a runner in scoring position, obviously the single is better. Again, this stuff isn’t rocket science. Because if they are good to great in OPS or WrC+, they are likely scoring a lot of runs. It’s inherent in the process of getting on frequently base and hitting for power. In a three game series, player could go 2-4 each night with singles (.500). Player B could go 1-4 each night (.250) but have hit two doubles and a homerun that bring in multiple runs. Both contributed well to the team for the series, but BA wouldn’t have told you much at all about player B.
Batting average shows you a location from Google Earth on top. You can kind of make out, see the roof and general landmarks. The other numbers are like looking at something from Street View. You can really see what you’re aiming for. They all tell you something, it’s just a matter of what one wants to really know. Last year, in 2015, would you rather have had Ben Revere on your team or Joey Votto? Would you rather have had Xander Bogaerts than Bryce Harper? Would you rather have had Ian Kinsler than Mike Trout? All the guys listed first had more hits than the 2nd. Hits are “important” in that they are one way to get on base and/or score runs. They are not more “important” than anything else, per se, in terms of evaluating talent and/or performance. Sure, there is some overlap, but no one in their right mind would pick the first team over the 2nd, even though the 1st team is the best “hitting” team you can put together. I would still pick certain individual players from the first team possibly. I would probably take Gordon over Panik (speed is the biggest difference), and many say Votto and Goldschmidt are about equal, so that one could go either way. Obviously I’m referring to the pre-suspension Dee Gordon, to clarify. Funny how there is not much disparity in the infielders- just perception in my mind at least, but that OF…. Complicated formula for batting average: Hits divided by (plate appearances minus walks minus hit by pitches minus sac flies minus sac bunts). I doubt anyone reading this post can actually calculate a batting average in their head unless the number you wind up dividing by is a round one with 00 at the end of it. The formula isn’t the problem. It’s the lack of context that’s the problem. I’ve literally never sat down and calculated WAR or OPS+ or wRC or wRC+, but I know what end numbers are good and which ones aren’t. And realistically, that’s all that matters. Could I calculate those? Sure, I could. I am pretty good with excel and I am decent enough at doing the maths. But I don’t really need to be able to do either of those things to use the stats and know which ones are good and which ones aren’t. That’s the issue with WAR specifically. Nobody truly knows what goes into calculating it. Don’t get me wrong, I like WAR as a stat, but it is a bit too complex for a more casual baseball fan I think. I know all that goes into WAR. But that’s the thing, I don’t think most casual fans could calculate AVG if we didn’t give them at-bats. The only real difference is that we’ve been told about average since the day we started watching baseball. If we had been told what a good WAR was, we wouldn’t care if we understood exactly how it was calculated. Think about football – we all know what a good quarterback rating is, but do you know anyone who can calculate it? Do you know anyone that even knows all of the stats that go into it? But the casual football fan knows that a 90 is pretty stinking good. Why? Because we’ve been told about it long enough on the TV and radio. Baseball stats are eventually going to be that way too. The problem right now is that we’ve still got people broadcasting games who refuse to accept what front offices are telling them are reliable, far more accurate means of player measurement. The “get off my lawn” crowd, so to speak. That’s starting to change and in 15 years I doubt there will be any broadcaster out there still going who isn’t using “advanced” numbers in a broadcast. Just for fun (I know…), I ran the correlation between OPS and wOBA, and OPS and wRC+ using all 2015 hitters with at least 400 PAs. As you’d expect, since OPS is made of OBP and SLG, they individually have high correlation. I was actually thinking of AVG to wOBA and AVG to wRC+. But the really small r-squared for the OPS to AVG correlation is a great argument for the futility of AVG. Thanks for taking the time btw. I am totally on board. I think a big problem with bringing people around to your side is what someone in marketing might call “optics.” If you call something “Advanced …” you are immediately going to alienate a portion of the population that does not consider themselves “advanced,” quadruple that number if you are talking about something involving math. I suggest removing the word advanced and just talk about “stats” and I would bet that you would have a less cool reception from some “old school” guys. This is really good point. I agree that the word “advanced” scares people. I like that GABP had added OPS to the scoreboard. It makes it feel less advanced, and more normal. That is incredibly important towards advancing this type of thinking. As a way just to show how things evolve, even in baseball, until the 1920s the “batting champ” was the player with the most total hits. No one even cared who had the best average! The crazy thing was they didn’t care if the teams played in the same number of games! It’s amazing how stupid this sounds now, and in 30 years I bet this “debate” will too. Thanks, Nick. But not really. I have no problem with OPS. Please use it if you will. But some of us have no problem reading and understanding BA and are also capable at looking at walks, total bases, slugging average, etc. Add OPS as a conventional stat, if you wish. But many of us have a good feel for the more conventional stats. I say that a spirit of tolerance should prevail. And, by the way, I am very statistically competent. I get what your saying, but if all that a radio broadcaster is telling me is a players average, than I know nothing about the player’s production. I’m not saying “kill AVG,” but if you are going to use it, you have to use another stat with it. Exactly, this is a big point. I like the widely used triple slash line of BA/OBP/OPS for this. I think the use of HRs/RBIs/BA as the slash line on a player is even worse than BA: it adds insult to injury. I’m not sure you got the point of the article. It’s that AVG isn’t a good way to measure individual player skill in a vacuum. Not that you shouldn’t look at it. I still look at it, too. I just don’t use it to determine anything about a player’s skill. No one in the world thinks Ben Revere is better than Mike Trout, for example. Right, here’s to the new slash line: BA/OBP/OPS. I am old school as hell but I’m coming around to the new baseball. You are right that batting average shouldn’t be the only thing shown but I would disagree about Chris Welsh. He is terrible. Most of the Reds announcers are terrible. Every night I watch and listen to the visiting teams announcers. If you want to know how good your players are the visiting announcers will tell you. Leave it alone!! Your delving into the realm of the redicilous. Like war is not the worst stat ever. You’re right. Any stat that says Babe Ruth, Barry Bonds, Willie Mays, Ty Cobb, and Hank Aaron are the best players ever is pretty useless. +25 for you and just you, sir! Not to play Devil’s Advocate, but there are a myriad of stats that say those guys are the best players ever. That’s why people knew that before they even knew what WAR was. Sure. No argument from me on that. Basic addition requires a math degree? Thanks Nick. I think you’re right on about using batting average to qualify if a hitter is “good” or not. I still use BA in a triple (quadruple often as I include OPS) slash lines because it does incorporate a more comprehensive view of the offensive contributions and it’s easy to understand for most people, as well as being a readily available. I also like to use wRC+ and OPS+, but I like statistics. I do feel like I’ve been having the discussion of Phillip Ervin a lot this season and the resistance I get is his BA. It’s not good, it’s currently at .229 and has been between .200-.230 for most of the season. Yet I’ve been insisting that he’s off to a great start to the season. Beyond batting average the rest of his stats have been outstanding. He currently boasts a .357 OBP (.389 wOBA) and a .836 OPS (142 wRC+). Considering the league average OPS in the Southern League is .696, being 140 points above that is awfully good, and is accurately reflected in his wRC+. Ervin is the perfect example of a player that cannot be evaluated by BA. Toddfather is hitting like .220 but on pace for 45+ HRs and 125 RBIs…thats a decent year I think? Fun fact: Barry Bonds, Magglio Ordonez, and Joey Votto currently all have the same career batting average (.309). Wait, that’s not true… my filter was set at 1990-2016. Bonds career avg is .298… worse than Magglio Ordonez. I don’t see how anyone who doesn’t like advanced stats would be on a baseball blog (this one in particular which has always been stat heavy). If you like just going to the game with your kids thats wonderful. But, who reads a blog to not get more detailed information! It’s like the people who tell you their Game of Thrones “theories” but then say they have not seen all the episodes not read the books. If you want to have an opinion it needs to be based on some minimal bit of information. Great article enjoy the read! Thanks Nick. Nice article. You make it easy for an old dog to follow along. Over the last couple of years, no matter the network, I look for the triple slash line at the very least when batters come up. Little by little, some of that is getting to the TV screen. This is a vast old school-wing conspiracy against the newer stats. These are the same people who were terrified of the metric system. I know these TV networks are in the entertainment business, but they are also in the information sharing business. Informing people. I just don’t get why they would want to withhold information from fans who want to consume more information and data about their favorite sport, America’s Pastime. They shouldn’t be worried about some perceived backlash from the old schoolers, and instead should be at the forefront of educating their fans on these newer stats. I’d like to see Fox Sports Ohio add a Sabermetrics 101 segment to their Reds pre-game show. Wait a second. Are you saying that baseball people should be reaching out to younger generations that connect with this type of information while at the same time maybe still including AVG for older i.e. “old school” fans as well? Why would a sport want to be inclusive and grow their viewership? Also, I know that not all older fans hate new stats and not all younger fans love them, I apologize for my over generalizations. I have read this site for the last 3 years. You would probably call me old school on stats. I have been trying to learn some of these new stats but with minimal effort. (I have a job and 6 kids that consume most of my time.) I hope you won’t think me too presumptuous if I make a couple of suggestions based on my experiences here. I have read a few articles here about the meaning of one or another of the new stats. Why don’t you collect these articles into a page for those who want to learn? It could be a tool for those who are new to this. Yes I am sure there are other sites with this info, but I am unlikely to go to them. I just might look here though. Honestly one of the issues for me is remembering what all the acronyms mean. How about an acronym key? You could put it at the end of each article that uses them. I wouldn’t feel so lost reading the articles that use the stats extensively. I had something else planned for tomorrow, but I’m going to write up this instead. I just reinvented the wheel. 🙁 Post going up tomorrow at 8am. I actually did learn a thing or two putting it together, and if one or two people use it here that wouldn’t have gone out elsewhere, I’ll count that as a win. BTW Patrick have you seen this. Thought it was pretty interesting. Interesting, indeed. I had not seen that before. Thanks for sharing, Jeff. In an ideal world, the broadcast team and reasearchers (along with the graphics folks for TV) would use one or two numbers to highlight what the player has been good at this season. Not finding lots of green but walking, show both AVG and OBA. and so on. Sometimes you see this for the playoffs when they can focus in on such details, but for a reg season game, when you are doing 6 games in seven days in two different cities sometimes. That grind might make that more difficult than it sounds. Overall, the stats just a snapshot on how a players season has gone and not nearly as deceptive as pitcher W/L’s can be..
Well, RBI is terrible. ERA isn’t bad for seeing how good a player was, just bad at predicting future success. RBI is great! It tells you how good the guys in front of you are batting. Tongue firmly in cheek. Nick – love the POV but rots o ruck! My background is in analytics (love the r2 btw) so I have been fully in on new stats since they added walks, steals and SLG% to the back of Topps cards in 1981! The one that kills me is the comprehensive WAR stat – my gripe being that Offensive WAR and Defensive WAR should be discussed separately. Hard for me to internalize Kevin Kiermaier and his sub .725 OPS being the 15th most valuable position player last year. I know it is done for a convenience (less numbers for people to grasp) but I don’t believe the weighting is correct. I’d hate to lose converts that will look at those numbers and say – “see, WAR is crap too”. Anyway, thanks for your articles. I’m in the same place with the WAR stat. I like the concept of a player getting credit for their offense, defense and base running, but there is still too much ground to made up with the weighting and accuracy of the Defensive numbers for me put any stock into it. All of the WAR stat descriptions admit the DWAR numbers are a work in progress and it takes more than a years worth of data for the numbers to mean anything. Not to mention I still don’t care for the concept of the replacement player. Well, it does mainly tell you that. But it also tells you that you did something more productive than striking out when those guys were on base in front of you. I was trying to make a joke without being too obvious. I am getting sold on the more advance statistics. I thought the argument was early on in a season ERA was misleading, could not think of away to word it that would sound like a legit concern, thought the RBI and clutch reference would be obvious. A little off topic but since you brought up Bryce Harper, I think teams are taking the wrong approach with him. When teams have actually been pitching to him he hasn’t been faring well as of late. He has only had 1 HR and 2 doubles in his last 60+ AB. (To put that in perspective, Billy Hamilton has been outslugging Harper since April 22 (.302 vs .396) His BA has dropped from .359 to .264, .SLG from .849 to .604, but his OBP has only decreased from .458 to .441 mainly because of all the walks. If you were only to look at OPS you would think he is currently doing great and for the year he is. But from an OPS standpoint, the walks have become a self fullfilling prophecy (I’m looking at you Chicago Cubs) so to speak, obscuring the fact that he has been mired in a little mini slump. Ya 60 AB is a small sample but until he breaks out of his slump I think teams shouldn’t be giving him so many free passes. Just my humble opinion. OPS is not the “be all/end all”. The triple slash line BA/OBP/OPS gives a lot more info. But if you have to go with just one number, OPS gives much more info than BA. Ya I know I was just commenting on Harper and the trand towards not pitching to him. I’ve been using triple slash for a long time. I tend to come down on the old school side of this general argument. Here’s my basic problem: Just as you say a homerun is better than a single (obviously), a single is better than a walk. Batting average may be overrated, but it is not meaningless. The problem I have is this “all or nothing” mentality. If one hypothetical player hits .350 with a .380 OBP, and another hits .250 with a .400 OBP, knowing nothing else, I get the feeling “new stat” people would choose the second player – which, to me, would be insane. Similar to the triple slash, I don’t understand why we can’t just add BA into the OPS. Add all three. To me, that would tell me more than just the other two alone. Nick and a bunch of us above are saying how BA is not meaningless. So you’re right on that but no one is disagreeing. If you add BA into OPS, you’re including it twice. It’s already part of slugging pct. Vada: Sure seems to me that some are arguing that it’s meaningless. Saying that it “tells you nothing” about how good a hitter is, is pretty much the same thing, no? And I realize you’d be adding it twice in my suggestion, but at least it would give the high BA player some kind of a credit for getting a hit. And it always seems to me like “new school” guys pretend that the rest of us think walks are bad. We don’t – we just think hits are better. Hits are better. No one will ever argue against that. Sabermetric “new school” guys especially. Those who know my posting have heard me say I’m not a stats guy. I do have a great appreciation for articles like this, especially when y’all explain it and do the comparison stuff. In the end, wins do mean the most from a team perspective – that’s the only true black or white stat – but the rest of this frames which players are more likely to contribute to a team win in some measurable way. Thanks Nick for this article … I think I’m getting the hang of what to look for. I doubt I’ll ever calculate it myself, but at least I’ll understand it better. Team wins tell us all we need to know. Pitcher wins, on the other hand, tell us practically nothing. This is an interesting concept I notice when watching a broadcast. The team needs to win the game, but, the discussion tends to go to whether the starting pitcher can get the win. Or, if the team loses the lead, it cost the starting pitcher the win. Some managers go out of their way to get the starting pitcher the win, even if it is not good for the chances of the team to get the win. “Old School” people seem to have a disdain for “stats”, but they love saves and wins, which are stats. Even as an 8-year-old kid, I already could see the uselessness of the pitcher win/loss stats. When a pitcher can give up 7 runs in 5 innings and still get a “win”, the stat is useless. When a pitcher can give up 1 run in 9 innings and still get a “loss”, the stat is useless. When a reliever can blow the lead in the top of an inning, but because his team retook the lead in the bottom of the inning he gets credit for a “win”, the stat is useless. Pitcher win/loss has to be the worst stat ever created. I wish they wouldn’t even keep records of them. The only win/loss that truly matters is whether the TEAM wins or loses. When I was a kid in the 60’s, the Sporting News, published once a week, was the one and only accessible source of useful baseball stats to we young fans. It included BA and also walks, HBP, and whatever was needed to figure out both OBP and slugging pct. So numbers-oriented fans like me would calculate both OBP and slugging pct., and put them together (using fractions of course, not decimals) and calculate what is now called OPS. Slugging pct. was referred to often as far back as the 50’s. I remember that Reds fans were proud that Frank Robinson, while everyone was talking about Mays and Aaron, led the NL in slugging pct. 3 years in a row. The use of HRs/RBIs/BA as the slash line on a player, instead of BA/OBP/OPS, is even worse than BA instead of OPS: it adds insult to injury. Of course HRs are very important (but their importance is captured by slugging pct.) and I don’t believe RBIs is a meaningless stats. It does measure something, it’s just a limited measure and terribly overrated by professional baseball writers, players, managers, etc. For example Jon Heyman, a highly prominent baseball writer, wrote in the spring that Votto and his 2015 season are overrated, look at his RBIs. And of course Daugherty (the quack Doc) cited that as a “real expert talking”. Preaching to the choir, I know. I still like batting average simply because it is a quick way to show me who has skill of physically hitting the ball. To me still the most difficult part of baseball. Drawing a walk is much easier than hitting a ball and sometimes I want to see the difference. Not trying to be difficult here, but if drawing a walk is easier than getting a hit, why are walk rates lower than hit rates? Really. Do you now believe a walk is better than a hit? Or equal! Not sure how you got that from my statement. A triple is harder to get than a home run, also, but me saying that doesn’t imply that triples are better than home runs. Probably the same reason in basketball a guy shoots for the basket even though it looks like it isn’t a smart move. Not questioning that walks have value. I know that they do. But…. let’s face it, until they can curve out the part of the walk that can be blamed on the pitcher then considering a walk 67% of a hit is silly. Not taking anything away from players like Joey Votto, but come on even a novice can tell that Joey is pitched around because pitchers simply don’t fear Brandon Phillips. Pitchers do fear Joey’s ability to make contact which if Joey wasn’t pitched around his batting average would probably be around .350. Imagine if Harper or Trout batted behind Votto. Hitting the ball is difficult even if the pitcher was to serve up a meat grinder down the center of the plate. Case in point is the home run derby at the all star game. Great players struggle at hitting it out even when served with the intention of hitting it out. Now to put things on a similar plate. If the pitcher chose to throw balls there is no relevance to who is batting. Hard to follow that logic. I feel like its nice to know how many hits vs at bats is good to know… even if they don’t count much into double, triples home runs and walks. You at least get to know how often the players gets to at least 1st base on a hit. Plus people don’t come to see a player walk… especially with how long it takes to get a walk. I personally like seeing how many homeruns someone has hit and RBI’s Wondering is there a stat that tells the percentage of RBI’s a player gets with runners in scoring position?? I like seeing OBP, never really cared much for OPS though…. Don’t know why …. Still trying to figure out what exactly wRC+ even stands for and how it is calculated. Outdated? It’s still a pretty damn good indicator if a guy can hit the baseball. Why don’t you argue with some guys who’ve taken pride in averaging over .300 for a career? Good luck. If I were to give you two players, one with an AVG of .298 and one with an AVG of .304, which would you take? Of course it’s not the only indicator of a hitter’s ability. Good grief. For decades they’ve listed BA, HRs, and RBI’s when a guy comes to the plate. Gave you a quick take on how they’re doing. These other stats are great. But for someone to lead their article stating that BA is outdated, back to my initial post. Sorry I didn’t get back sooner- lots of work to do. For some that’s become outdated, too. So, this is about the 4th time I’ve been insulted in this thread. Way to keep it classy, folks. Bonds was great at hitting HR and RBI…. Morris was great at hitting Singles and getting on base. This is why we have multiple stats to look at for a player. Each stat tells a story of what a player is doing. Batting average is nice to know about. I am for the broadcasts showing OBP too. Unlike the Win which is in my mind so easy to lose for a starter (somehow should change the rules for a pitcher to get a win) Batting average serves a purpose especially for the common fan who probably does not know what SLG even is. Suggested rule for starter to get a win. Starting Pitcher must pitch at least 6 innings and when they leave the game their team has to have the lead no matter who is on base. We already have the Hold , which is a totally underrated stat and a save for relievers who finish games out. Blow save is for those relievers who can’t hold a lead. I’d like to see something relatively simple yet reasonably effective that indicates how effective a player is at creating offense. Work off it off the concept of bases actually advanced out of possible bases advanced, i,e, a man batting with the bases empty has a possibility of advancing 4 bases (solo homer); a man batting with the bases loaded could create 10 bases advanced (grand slam). Express it as a % of the total possible. Or employ an index like Runs Expected. Measure whether the hitter improved or damaged the run expectancy. I think perhaps there is a divide between those of us more interested simply in whether a hitter performs well and those wanting more detail as to how he does it. I’m happy to for the most part leave the intricacies to the folks who build teams for a living. I think I told you I contacted the guy that wrote this up for FanGraphs (he works for the Cubs now), and said I could have at it… upon exploring it over this off-season, I realized I can’t do it. Requires a lot of coding and database work, of which I have no experience. Once upon a time I was at or very near the guru level on desktop relational DB’s (dBase; Foxpro et al) before I took the fork in the road into network/ hardware engineering and support. I was increasingly using the Fox SQL implementation in relational queries when I made the career switch. Overall I’d rate myself as probably a rusty intermediate at SQL, long/ deep on concept, short on recent experience. Find me on Facebook or Twitter (WordPress profile) if you want to talk about this. But, something very, very close is straight up RE24. It feels like people that only like AVG are saying, “I’m not good at math.” Not something you should brag about. No one walks around saying, “I no good at illiteracy.” Both are much important. The funny thing is, also, there is NO math involved in understanding these stats. No one calculates them by hand… just go look them up! No one questions the math and engineering the smart people do that makes the internet work, or that keeps the roof held up on your house. So why question the smart people that did the math to say AVG is garbage for evaluating a player’s skill at baseball? I’m not sure why OPS came to be widely used as opposed to other stats. It seems to me this number (does it already have a name?) should replace OPS: total bases divided by at bats, where walks count the same as a single. Why is the more complicated OPS given more play than that simpler calculation? Maybe because slugging % had already been devised and come into use as a way of weighting hits??? What you’re proposing is basically a less accurate version of weighted On-Base Average (wOBA). It gives proper credit for each of a walk, 1B, 2B, 3B, HR, and HBP and then divides by all those things plus sac flies. wOBA is a great metric, by the way. I realize wOBA is more accurate, but it’s also complicated and not intuitive to understand for average fan. If I call my number “bases per at bat,” I think we have a middle ground: a number more useful than AVG, OPB, or SLG, and easier to understand than wOBA or WAR. OPS kind of fills that niche right now, but I’m wondering, why is adding OBP to SLG better than modifying the SLG formula to account for walks? I’ve recently heard some fans groaning again about Votto’s contract. Joey Votto ranks #36 in salary in 2016 for MLB. Tied with Troy Tulowitzki and Shin Soo Choo. Here are a few players ranked ahead of Votto. Ryan Howard, Josh Hamilton, Joe Mauer, Hanley Ramirez, Jose Reyes, Jayson Werth, Matt Kemp, Jacoby Ellsbury, ARod, James Shields, Matt Cain, Carl Crawford, CJ Wilson, Jered Weaver, and Rick Porcello. How many of those are worthy of Votto? FWIW, Homer Bailey tied at #44, BP is ranked #81 and Jay Bruce #88. So, pipe down to all those Votto critics. Well, here we go again, the elitist attitude that saber freaks are smarter than every one else. Hate to break it to you, Nick, but all that attitude does is expose how dumb you are. There are so many flaws in your attitude and overly simplistic thinking that I won’t touch on them all right now, but I’ll hit a few real quick, then I gotta go. First of all, there are many times a single is just as good as a home run. When? When the guy who singled ends up scoring. Both ended up in being a run. End of story. But let’s go deeper. Well, you say, a home run is a guaranteed run. A single took some work to score. Well, here’s the problem with THAT overly simplistic logic. Home runs are rarer than singles. And home run hitters are rarer than singles hitters. So you have more opportunities to score with singles, right?, since there are gonna be a hell of a lot more singles over a season. Whoa, did a light bulb go off in your head YET? Most guys are single hitters, not HR hitters, so when they single, it’s exactly what you want. Scoring chances just went up. 2 guys single, and you got a mini rally. Again, these are not HR hitters to begin with, so a single from them is the best result expected in, what, 92-95% of the cases. If they try to hit a HR, they fly out 90% of the time. So for every HR they end up hitting, they hit .090 trying to hit one. But if they stay inside themselves singllng, they hit .280-.300. So in their case, very HR is haunted by all the other bad consequences. One more basic issue: runners on base can energize an offense, make the pitcher work harder and get tireder, cause managers to make mistakes guessing what comes next, and can lead to big innings. For example, 2 guys single, a HR hitter comes up. Guys dancing on the bases, fake double steal, pitcher gets distracted, throws over a lot, then grooves a HR pitch. 3 runs score. Of the 3, 2 came from singles, right, not HR, but the runs count the same, so the singles were equally valuable. Plus, the singles guys helped the HR guy get his pitch by dancing around and upsetting the pitcher. In that case, you have to say the singles pretty much helped produced the HR. There are so many more ways to counter your silly, over simplistic arguments. When you isolate yoiur stats from the whole picture, you ignore the reality that a baseball team is an wholistic,synergistic system, where every stat is influenced and in a relation with every other stat of every team in any league. Managers and coaches understand this viscerally from years of experience, but too many saber geeks, on the other hand, often try to use complicated math to hide the fact that they have virtually no feel for how the game is meant to be understood. Calling people “dumb” on the internet behind a pseudonym… classy. Hey, are you blind, Patrick? Nick proclaims the superoirity of his way of thinking. He actually said his way is much smarter than the old way of using averages. He also implies his higher intelligende in a few more place. Logically, the old way becomes the dumber way, right? This is the same old elitist thinking by so many saber folks that I still run into, most of whom couldn’t hit a curve ball when they were 11 and will never truly understand the game and its nuances. I felt it was important to counter his contention by pointing out he might be tricking himself into being dumber, by convincing himself he’s the smarter one, when maybe he’s not. Thanks for not responding to my points, but rather obsessing on my reverse criticism. Sabermetrics is based on logic, right? That’s exactly what I used here. And btw, you chose to pile your own level of sarcasm on top of me, instead of actually responding to my points. How classy is that?. Next time, respond to my points. You are correct that some players should not try to hit a home run. The point is, Batting Average is not a good measure of a players value. As you noted, some players can utilize great base running skills once on base. Does it really matter if they get on via single or walk? I happen to think a walk is as good as a single, in most cases. Do we not agree there? I simply threw out a couple situations to counter the overly simplistic contention that a HR is always better than a single. In isolation, yes, it is. But a baseball game is not played in isolation. Batting average is still an extremely useful stat. Two reasons. It’s quick and easy, and it tells me how many times a guy hits the ball where they aint. It’s super important to hit the ball where they aint, right? I mean, how do you even try to argue with that? If I wanna know how many times he walks, too, all I gotta do is look it up. Easy peasy. Theo Epstein has been building the Cubs around guys who can get on base since 2012. I’d say he’s 2 for 2 using that philosophy, Boston and now the Cubs. That’s the type of player they want, not the Jay Bruces, Adam Dunns, Todd Fraziers, or Adam Duvalls. Counter that approach with the Reds. Pete Rose hit for average, and he was the engine that drove many good offenses for years, not just here in Cincinnati. And you can tell he could hit simply by looking at his batting average. Sabermetrics has its place, but it’s not the same place that saber geeks like to proclaim. In the hands of the right people, real baseball people who can also analyze talent when seeing it in real life, it can be very useful. In the hand of a math geek who never played, it’s like handing a 3 year old a grenade. I like most of the new analytics but when they start tracking the revolutions of a particular pitchers curveball,etc then it starts going over the top? I have a feeling if you went to a party with some of these people you would end up talking about Chewbacca and Superman/Batman all night and I’m a grown man. I think with all these analytics and stats it’s all about trying to zero in on traits that portend success and productivity. Certainly the advanced stats and measurements like revolutions are taking a deeper dive and more detailed look into baseball then we have in past decades. It can be overwhelming and dizzying processing the sheer amount of info and attempting to place this new info into the bigger picture. As fans, it’s incumbent upon us to decide to what degree we want to engage with that information. Thus far, I’ve chosen to ignore revolutions until we get more perspective on it. Others have chosen to disregard WRC+, WAR, etc. I think in time we will as fans gain a better understanding of where these stats and analysis fit and become less overwhelmed. None of these advanced stats tell you what’s in a guy’s heart, what kind of drive he has, or how invested he is in getting better. Math is completely devoid of the emotional side of a player, which makes it inherently deeply flawed. The deeper the analytics, the further removed from the personality makeup of a guy. Deep sabermetrics is an exercise in playing around with computer math, nothing more. It’s rather silly, really. The bottom half might out hit the top half. BHam is on his bereavement leave. Peraza called up to replace BHam. Ohlendorf suspended 3 games for his bean ball. 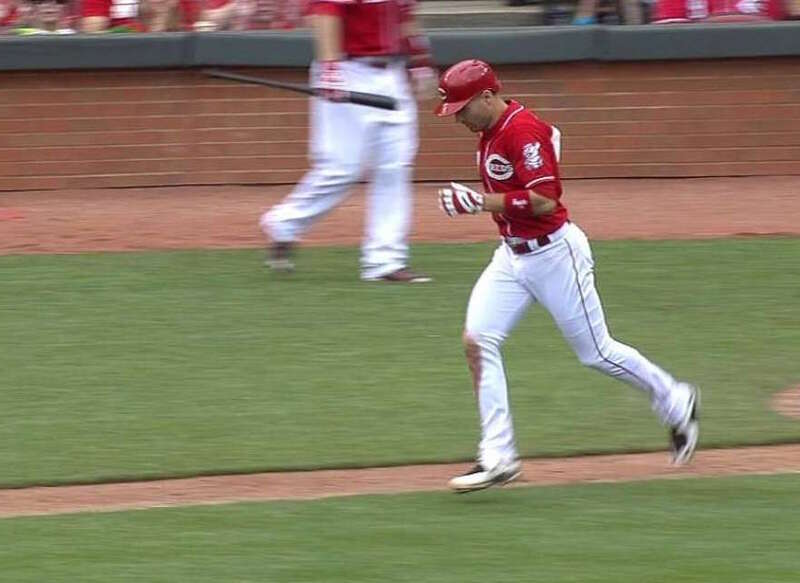 Riggleman is managing the Reds tonight, Sheldon reports. Price serves out his suspension. It really doesn’t make any sense. Bring up another player if Peraza is not going to start. Hopefully he’ll start 1 of the 3 games in PHI. Suspending terrible pitchers with no command for hitting guys… that’s a new one on me. Batting average tells you who CAN’T hit, so therefore it is useful. I don’t want a guy on my team who hits .227. Once you clear out the “dead wood”, then you can move on to OBP -who gives you a good at bat? and then to Slugging- who has exit velocity and pop? The problem with the Reds is they don’t apply a floor to BA or OBP. If you cant hit .240+, don’t take a guy. If you cant get on base at a .340 level, don’t take that guy. Why are stolen bases ignored? As long as you aren’t Billy Hamilton and can get on base at a credible percentage, they are important. 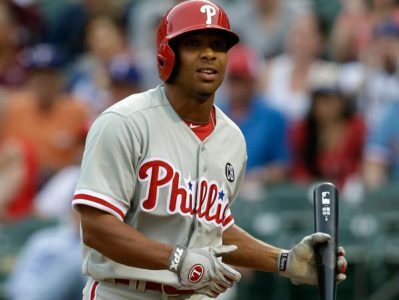 What is Ben Revere’s slugging percentage and OPS if you add his total bases gained from his 50+ stolen bases…..and Dee Gordon’s 70 stolen bases. If Jose Peraza hits.295 and has an OBP of .345 and steals 50 bases and has a little pop, he’s a great lead off hitter. I’m going to value those 50 extra total bases and runs created and double plays avoided and innings extended and errors forced. You wouldn’t want a guy on your team who hit .227, walked 14% of the time and hit 40 home runs? Only if Pete Rose, Joe Morgan, Joey Votto and Jesse Winker were on that team, too. On a small market team with limited resources- no. He’s not one of my core guys that I build around. As a 4th outfielder or pinch hitter or an add-on to get your team over the top for a 2 year window….sure. The other issue with batting average is if you are that poor of a hitter, what happens when you age and aren’t at your 26-28 year old peak? Adam Dunn fell off the planet by age 30. Adam Dunn hit 75 home runs in his year 32 and 33 seasons. Walked more than 14% of the time. 10% above MLB-regular average in run contribution. Massive value. He signed a 4 year 56 million contract in 2011 dollars-widely considered one of the worse contracts ever. His 2011 year -age 31 season-is arguably the worst season ever by an everyday MLB player. The .159 BA is massive value? He struck out 222 times in his year 32 season and never lived up to the contract he signed…because he hit .202 over that 4 year time frame and set records for strikeout futility. I doubt many White Sox fans look at that 4 year span as massive value. A batting average threshold does matter. Batting average, strikeouts and “what many White Sox fans” think. Strong. I didn’t say all four years. You said in your previous post that Adam Dunn dropped off a planet when he turned 30. You have the right to your own opinion, but not your own facts. For two years – his age 32 and 33 season – he was 10 percent above MLB-regular average in run contribution (wRC+). That takes into account all his stats, not just AVG and K. All his stats. All his stats. Not just AVG and K. All his stats. His overall performance for all his contract after age 30 made him a very poor value and a poor player from 2011-2014. You can’t cherry-pick which stats you like and in which contract years you like them. 4 years 56 million age 30-34…..that’s how MLB works. He hit .159 in 2011 and .202 for his 4 years. He was so bad he almost walked away from his guaranteed contract. Massive value there. Don’t ask me ….ask him! He was a poor DH on a poor team. It was a terrible contract. Never mind the other deficiencies in his game that mandated he play in the AL. HIs poor batting average and historical strikeout percentage identified him as a player who had no margin for error once his walks and HR started to decline. The facts support that. Lot of opinions. No new facts. Batting average. Batting average. That one statistic can’t tell you whether a player is doing a good job on offense. Cherry picking is choosing one stat (batting average) to look at instead of all of the stats available. My only point was that Dunn didn’t drop off the planet after age 30. You just had that flat wrong. You didn’t say his 4-year contract was bad. He had two years of 10 percent above MLB-regular average in run creation after he was 30. So he didn’t drop off a planet. He had two excellent years.